As a foreigner, leaving India without a picture of an elephant (or a cow) is like an Indian coming to U.S. and not going to New York City, the Statue of Liberty or Niagara Falls. Of course I like and, in fact, always loved elephants. Of course, though Ganesh is no typical elephant. He is God. A human with an elephant’s head. Soon as I heard about this, being an American, I had to know more. “Who is this Ganesha?” I always wondered. Then Ganesha came into my dreams and I knew He would be with me forever. I knew I had to see this Ganesha in person. I was suddenly drawn to this god that I had never known before. I wanted to know everything about Ganesh. I began reading books and going to Hindu temples in U.S. just to learn about Ganesh. 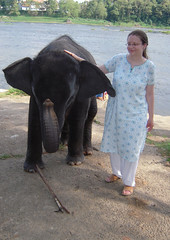 Of course, I learned a lot of other things, and eventually my interest in Ganesh and love for Indian culture in general took me to the land of India. Majestic, breathtaking and tangible memories flood me as I fondly remember the two years I spent in India as the first American to graduate from Madras Christian College. Then the irony sets in. Yes, me an American who studied at a Christian college wanted to know all there was to know about a “Hindu” deity named Ganesh. He, of course is well known for circling his parents. His parents being his world. I envied that myth. I also knew there was something beautifully ironic about Ganesh. Elephants are cute, especially baby elephants. But is a child or a man with an elephant’s head cute? I guess his mother, Parvathi did not think so at first and cursed her husband, Shiva, Ganesh’s father for this creation. However, she grew to love him as we all have. Of course, Ganesh’s beautiful irony is that everyone is born without human perfection as the two words ‘human’ and ‘perfection’ are of course complete opposites. From the beginning, Ganesh has taught me that everyone is different, just that some people’s differences are more obvious (and therefore, more publicly ridiculed) than others. The irony of me learning this while in India studying social work is in itself a powerful lesson. Then I knew I had to pray to Ganesh. After all, these lessons were guiding my life while in India. So, I attended Ganesh Chathurthi celebrations both years I stayed in Chennai. My friend’s mom was known for keeping a clay murthi of Ganesh in the home during the festival for three, seven or nine days. On one of those days, someone would take the murthi and submerse it in the local well. The details of the story surrounding this ritual – such as the characters names and what they did- are unfortunately forgotten. I do, however, remember the answer to the question I asked, “Why is Ganesh made from clay?” To this, I was told that, “What we take from the earth must be given back without harm.” Of course! Clay is natural and is taken from the bottom of the lake where water originates, so to put it down the well was completing the circle of life. And, unlike the murthis of Mumbai, these murthis that Amma purchased were made of 100% clay, the only decorations on Him were kum kum powder and fresh flowers, all 100% biodegradable. I was immediately drawn to this ritual as it made perfect sense to me. I made a commitment to myself that when I came back to U.S., I would find my own special way to continue this tradition for myself. 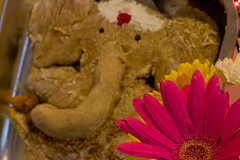 When I came back to U.S., I did not forget the promise I made to Ganesh in India. I would continue celebrating his birthday even here in U.S., I would need to “think outside the well” to find a way to recreate the ritual with the same basic meaning- taking from and giving back to the earth without harm. I searched everywhere, but I could not get clay that I was satisfied with. So, I thought about other materials I could use. So many ideas came to mind and finally the perfect idea surfaced- bread. We feed bread to birds and squirrels and fish in the park. Fish swim in the water. Even if they don’t eat the bread, it dissolves into the water. It is therefore, biodegradable! What a perfect solution! It began as an experiment, and within the first mix of all-purpose flour (maida) and water, I fashioned dough into the shape of Ganesha. He was not sitting up like the clay murthis in India, but the image was recognizable as Ganesh. While fashioning Him with my hands, I wondered how I would create his eyes, sweet laddoos and sacred thread. I decided he’d have black eyes. For that, I used peppercorns. I decided for a sacred thread, it could be a line of any spice that was dark in color. One year I used cumin (jeera) seeds, another year I used fenugreek (methi) seeds. I usually apply the sacred thread first, then laddoos, which are basically small balls of the dough coated in turmeric (haldi) powder and then, lastly I add the peppercorn eyes. Then, after I see Him looking at me, I put Him in the oven to bake. After He hardens and browns a little, He is removed. This is when we put Him on the alter prepared with fruits, agarbathi (incense), coconuts, flowers, diyas (lights) and other decorations. After we set Him on the alter, we present Him light, agarbathi, fruit and flowers and then apply the viboodhi and kumkum to complete His look. There He sits for 3, 7, or 9 days as Amma has taught me. Then on the decided day, Ganesh is carefully moved, placed into a box, remaining on his baking sheet, with all his flowers, fruit, agarbathi and prashadam to go to the lake or river. Usually it is a small family affair, me and my husband and if his dad is here from India. This last year, though (2007) our good friend also joined us. A pakka Marathi girl, she added some authentic regional flare to the occasion. Usually we say small prayers to ourselves, then dunk Ganesh in the water while shouting, “Ganesha Bappa Moriya,” decorate Him in the water with flowers and fruits and eat our prasadham. In 2007, we had a very special ceremony, something I never imagined in the U.S.! In 2007 my husband, my friend, my father in law and I stood by Cowanesque Lake in Pennsylvania and chanted mantras and sung bhajans while ringing the bell and breaking coconuts amidst the beautiful mountain scenery that surrounded us and the majestic lake. Getting lost in all the festivities, one may think it was not U.S., but India itself! It was the most memorable Ganesh Chathurthi to date and hope years to come are as memorable. If you are unable to view it clearly in this reader and can't see the article on the website, please email me- jennifer at alaivani dot com. 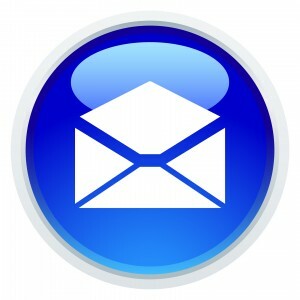 In subject line please write LOKSATTA. Thank you. 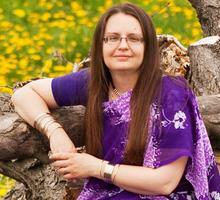 Photos of 2008 Ganesh Chathurthi Celebrations at Hamlin Beach, NY, USA. Happy Ganesh Chathurthi on Wednesday, September 3, 2008! 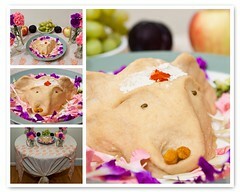 Want to know when is Ganesh Chathurthi in 2009, 2010, 2011, 2012 and beyond? Follow my India America Interfaith and Social Calendar! Owner of this blog; Jennifer Kumar, CC, MSW, is a cross-cultural coach helping people find comfort in foreign lands through multicultural advising, interfaith coaching, expat mentoring, English as Second Language conversational and life skills coaching and more! Contact her for more information at authenticjourneys at gmail dot com or follow her on Facebook. Read more about her bio and credentials here. This is a lovely post, sensitive in every way. Thank you!